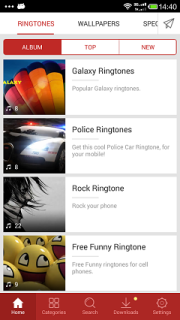 9Apps not only gives you top trending apps &amp; games recommendations from Google Play, but also offers free downloading for high quality wallpapers and ringtones. aEï¿½1aE' Abundant apps,games,wallpapers and ringtones with professional recommendations. --More than 200 thousands of free resources are waiting for you here. And, professional editors will highlight daily recommendations, either. aEï¿½2aE'Concise visual effect with smooth operation. --Small-sized apk helps save storage for your device; Also, concise interface and smooth operation give you super awesome user experience. --Quickly finish downloads without any block happened during the whole procedure. aEï¿½NoticeaE'Apps or Games in 9Apps are picked from Google Play. Users will be redirected to Google Play for downloading and installation. LINE Free Calls And M..